What is Equine Sports Massage? Is your saddle causing your horse back pain? A quality fitted saddle should evenly distribute pressure across your horses back. An ill fitting saddle can counteract the correct physics of the horse’s back, causing muscle imbalances & pain which often lead to reduced performance. A poor saddle fit doesn’t always just cause pain across the back either, and can often affect other muscle groups too. This is why It is vital that your saddle fits your horse!! A thermal imaging device can help detect subtle temperature changes that result from the increased pressure, leading to increased friction and subsequent heat, caused by the saddle. 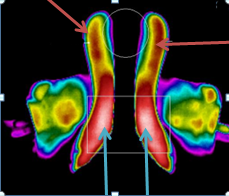 The image shows a saddle which has been taken off a recently exercised horse, captured with a thermal imaging camera. 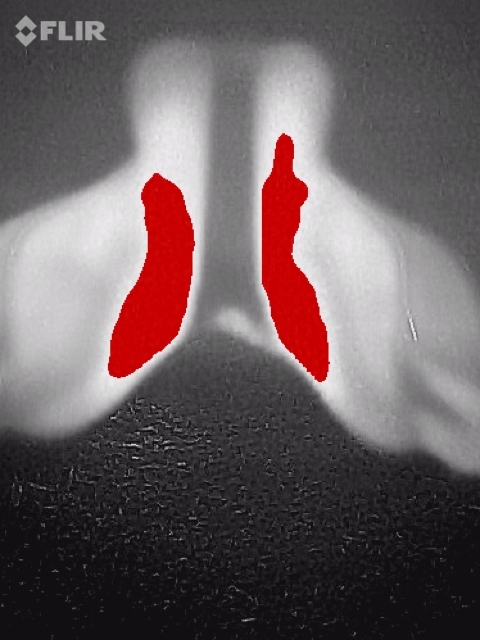 The red arrows indicate red heat patches, and suggests that the pressure is not evening distributed. The Blue arrows point out where there is increased pressure points, showing hot spots, most likely caused from a saddle which is too narrow.